Use light line. It’s simple: fish can’t see it. “But wont they bite me off?” No. The line slips between their teeth. If it’s good quality line that’s not an issue. You are more likely to get bitten off using heavy trace. I've see snapper landed up to 30lb on 12lb line with no trace, hook just simply tied to the end with a spider hitch double, tied in the 12lb line. You’ll hook more fish, get more bites and land more fish. Hold your reel in free-spool, with your thumb on the spool or, if you prefer a spinning reel, get one with 'baitrunner' mode. This keeps you in touch with the fish right from the beginning. If the fish are are finicky you will feel more bites. Run ‘em or smack ‘em? 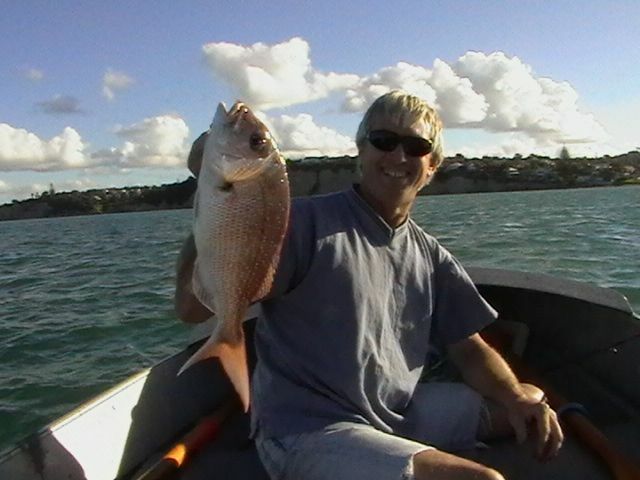 With snapper you either have to let them run a bit or smack them straight away to set the hook. Generally, all the fish in the school will behave in the same way so once you have sorted out how they are biting you will hook more fish. The same can be said for bait choice: if your buddy is catching them on a hot bait get some of his. Burley can sometimes can lead the fish away so start with a few exploratory baits. Chemical hooks make a huge difference to hook-up rates. Owner and Gamakatsu make some very good hooks. Octopus style hooks are best, sizes 5/0-8/0. Maintenance: check the point of your hook and make sure it's not bent or dull. Check your knots and trace. Take an extra minute when tying that knot – there is nothing worse than getting back a pigtail on your line with no hook or fish. Hot bait: Whole Salty Dog NZ pilchards, brine soaked, 1st grade.